China could widen the trading band around its currency in response to Trump's tariffs, but that wouldn't give it full policy autonomy. It would still need to defend the new edge of any trading band. The high frequency indicators for Chinese intervention in the foreign exchange market in September show modest sales. The PBOC balance sheet indicates that China sold just under $20 billion in September. The usually more reliable settlement data, which captures the activity of the state banks as well as the PBOC, showed slightly smaller sales in September. But the settlement data also suggests that the selling started earlier, in July — a point also made by Shen Hong of the Wall Street Journal. Right now, though, there is less interest in what China has done in the foreign exchange market than in what China will do next. Particularly as it seems likely that the Trump administration will expand the set of products covered by tariffs at the turn of the year. The pressure on China’s currency back in September was manageable; China’s hand isn’t being forced by large-scale outflows. $20 billion in monthly sales won't break the back of the People's Bank of China. China isn't short on reserves. The October data may show more pressure, but likely far less pressure than back in late 2015. I don’t have any great insight into what China will do. But I do have a sense of China’s options. One: Continue to manage the yuan against a basket, and defend the current band—which would mean no further depreciation against the basket. Any moves against the dollar then would be a function of the dollar’s moves against other currencies (at least so long as the yuan is at the weak edge of its band). Two: Adjust the band, and allow the yuan to depreciate to the weak edge of a new band. This could be done slowly, or it could happen abruptly. The challenge would be to set the new edge of the band after a period of depreciation (slow or fast), and then to defend the new weak edge of the band in a way that convinces the market that the yuan won't fall further. Three: Let the yuan float down…until it finds a natural bottom. 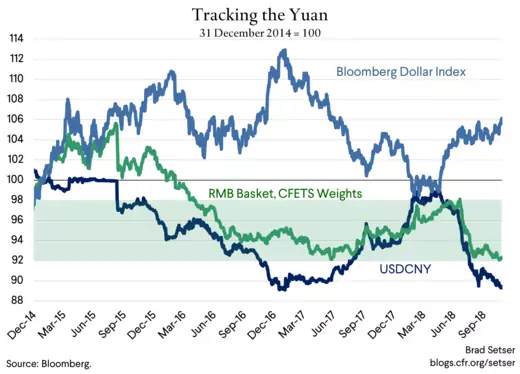 I am assuming China now manages against a basket, not against the dollar, but conceptually the options don’t change much if the yuan is in fact still managed against the dollar. The yuan is obviously at a key level against the dollar right now; it hasn't broken through seven for many years. And it is also right at its post-2015 depreciation low against the CFETS basket. The first option in some ways would be the easiest for China, financially speaking. China's depreciation in 2015-16 has more or less undone the real appreciation that came from following the dollar up in 2014. 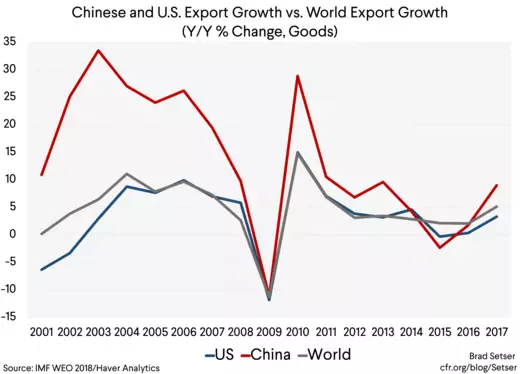 At its current level against the basket—and in the absence of any major shift in global tariffs—China’s exports would likely continue to grow at a pace that exceeds the overall growth in global trade. China’s trade surplus has fallen a bit in the last few years because of the rebound in commodity prices, not any real weakness in exports. By holding the line against further depreciation, China would avoid creating potentially self-fulfilling expectations of further depreciation. Such expectations, more than anything else, have driven pressure on China’s currency. There actually wasn’t any real pressure on China’s currency before July. The financial account in the first part of the year was healthy. China was if anything building its reserves (see the balance of payments data), and the state banks were adding to their holdings of foreign bonds as well. Keeping the currency stable would likely help keep the financial account stable, by encouraging bond inflows and discouraging residents from moving large sums in foreign currency as a hedge against further depreciation. Of course, holding the currency steady has one big disadvantage: it would force China to absorb the full effect of Trump’s tariffs without any help from a weaker currency. The second option is more or less another controlled depreciation, whether rapid or slow. It has the usual advantages of a weaker currency—namely, a positive impact on exports. China’s exports have typically responded as theory would predict to a weaker yuan. See the outperformance of China’s exports relative to global trade in 2017. But it has several disadvantages too. A weaker yuan would invite the United States to expand the scope of its tariffs—or to raise the level of the tariffs. Trump doesn’t need to designate China as a manipulator formally to take offsetting action, he has all the legal authority he needs under the current 301 case. And it might invite other countries to raise tariffs too, as the combination of a weaker yuan and high U.S. tariffs would encourage China to export to other markets. China wouldn't have trouble getting the yuan to depreciate a bit—the market is pushing that way now. The challenge would be to keep the yuan from depreciating by more than China wants. Maintaining control over the depreciation would likely require that China use a portion of its reserves, as well as retain significant controls. The problem with a controlled depreciation is that it invites bets on further depreciation, and the easiest way to bet on further depreciation is to hold dollars. Interest rates on dollars aren’t that different from interest rates on the yuan these days, so there isn’t a big penalty to do so. Ultimately, I think China could control the depreciation and set a new lower level on the yuan. But doing so would likely use up a portion of China’s reserves. (And yes, I know it is counter-intuitive that a depreciation burns through more reserves than holding the currency steady, but that is the clear lesson of 2015-16; the important point is that controlling a depreciation once it starts is hard). Finally, retaining a basket peg (with a band) means that China wouldn’t really have full monetary policy autonomy. Once the yuan is at the weak edge of the new band, it would still likely need to follow the Fed’s interest rate decisions. Indeed, it might need to maintain interest rates above the Fed, as it would need to give Chinese residents an incentive to hold yuan in the face on the ongoing risk of more depreciation. The third option is the cleanest—just let the yuan float, and let the market drive the yuan down. It would free the PBOC from the Fed. It would protect China’s reserves. But it also has a couple of downsides. The Trump administration almost certainly would raise the level of tariffs as China depreciates. 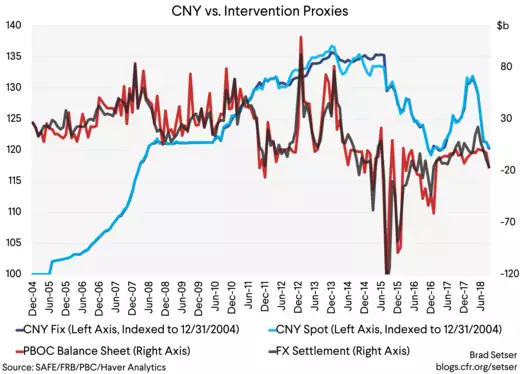 The last foreign exchange report didn't name China, but it also made clear that the Trump administration wants China to resist depreciation pressure as forcefully as it has resisted depreciation pressure in the past. But the real risk is that a big fall in the yuan delivers a nasty shock to the global economy, one that rebounds back against China directly and indirectly. Directly by lowering global growth. China is a big part of the global economy, and if the yuan pulled all of Asian currencies down, a Chinese “exit” in response to Trump’s tariffs would end up delivering a significant shock to Europe. And those emerging economies with more dollar debt than China would be in a difficult bind should their currencies come under additional pressure. Indirectly by reducing domestic confidence in China, and thus potentially making China’s own economic management harder. The theory of course is that an independent monetary policy should help to stabilize domestic conditions. Floating lets China set its interest rate in response to China’s own economic needs, and thus should make China's own economic management easier. But the transition to a float would itself likely be a negative shock, one that would reduce confidence that China’s authorities can effectively control the direction of China’s economy. So China might in effect need to do more stimulus—whether monetary or fiscal—to offset the shock to confidence from an exit. And it might need to do more to reinforce the stability of its financial system too, as the failure to maintain control over its currency could be viewed as a dent to the credibility of China's broader financial backstop. That at least is how I see the pros and cons. The easiest course would be to try to soften the edge of the band, and hope that this doesn’t trigger too much pressure or risk too big of a move. But I am not totally sure a gradual expansion of the yuan's trading band will be possible. Not with the yuan testing its post-2015 lows against the basket, and not with the yuan hovering on the edge of passing through 7 to the dollar. 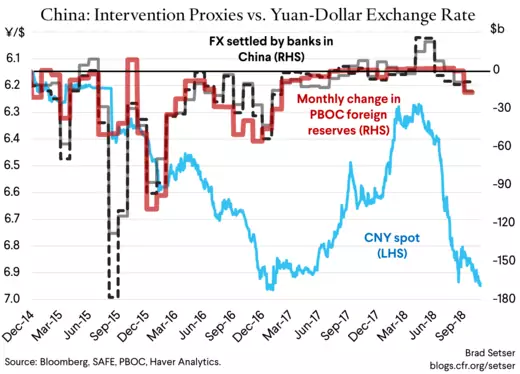 * The last time China actively intervened to move the yuan up or down against the grain of the market was in early 2014, when the PBOC pushed the yuan down (away from the strong edge of its band) to temper appreciation expectations. It could have of course intervened to change the direction of the market on other occasions; China doesn't disclose its actual intervention. But the bulk of China's purchases (and sales) have come to keep the yuan from appreciating (depreciating) further, e.g. to limit a market move, not to change the direction of pressure. ** Gwynn Guilford generally does an excellent job explaining complex market dynamics over at Quartz. But her argument that China would push the yuan up if it sold Treasuries ("dumping Treasuries would drive up the value of the yuan against the dollar—amplifying the already harmful effects of Trump’s trade war on China’s competitiveness") felt a bit off to me. China could easily end up selling Treasuries (and other reserve assets) to counter depreciation pressures. In that context, Treasury sales would meet rising private Chinese demand for dollars, not bid the yuan up.